℗ & © 2006 Rephlex. White circular sticker on front: AFX: "Analord compilation / First time on CD! www.rephlex.com / Distributed by: SRD (UK), JVC, Forced Exposure, La Baleine, Neuton, Rough Trade, Lowlands, Wide, Inertia. Made in England", followed by barcode and cat#. 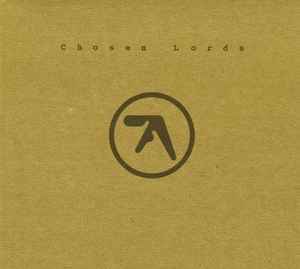 Tracks 1 & 10 previously released on Aphex Twin - Analord 10, tracks 2 & 8 on afx* - Analord 05, track 3 on AFX* - Analord 07, track 4 on AFX* - Analord 04, tracks 5 & 6 on AFX* - Analord 03, track 7 on afx* - Analord 06 and track 9 on AFX* - Analord 08. Released in a cardboard Digipak with clear tray. Well, a good friend of mine has all of the analord EP`s. I have the chosen lord. There are some very good tracks missing here..
On the other hand, if AFX put all the best tracks on this cd, the analord-series wouldn`t be wurth nothing. Music sounds a bit dated aswell. Almost sounds it comes from the early 90`s. If only Phonatacid was on this cd i would be perfect. I absolutely loved "Crying In Your Face" and "PWSteal.Ldpinch.D", but for some reason many of the tracks failed to move me. Don't get me wrong most were great, just not amazing. If this was the first time I had ever heard RDJ I'm not sure I'd buy the disc. However I am an RDJ fan so I think I'll download the entire Analord series and give it another go. This will sound contentious, but I like the Analord series the most of James' recent work. I like how the use of old gear imposes some limitations and how one can become inspired within that context to really push the gear. True Chosen Lords doesn't display the best compositions however it does afford the casual listener a glimpse into the Analord sound aesthetic. alot of talk about the track selection, but i agree with the songs selected. of course, that coming from a person who eagerly ordered every 12" when it came out to ensure i would have the whole lot. the whole point of this was really about the 12" and giving those of us who still have record players in our house a chance to use them (no, im not talking about "DJ's" here, but normal folk who are not obsessed with finding the next bangin track, but rather just like listening to records at home). i have a minidisc player too, so of course it was only a matter of time before copies of all the records made it onto my ipod, however, they sound liek crap compared to laying down the wax at home. when the cd came out i too was a little surprised that nothing from vol. one or two made it, but considering vol. 2 is pretty much the best one, and also considering that it really sounds the best crankin out of a good home stereo, and not computer speakers in a persons office, this actually makes a twisted kind of sense to me. ps: they were doing a whole catalouge re-press of basic channel at the time that these were coming out, man did that ever make for some happy trips to the post office!!! Its a really great simple work. Although im not familiar with Acid to know that this is not ground breaking, it doesn't really matter, good tunes are good tunes, no matter how innovative or plain they might be. The analord series is just another testement to james amazing work with Synths. He's the only one ive heard to this day to actually make them sound like a full fledged orchestra(I care because you do and Surfing on Sine waves). Also great for your Ipod/MP3 player. It's some of his only music you can just listen to, but not really listen to, talk to people, and just do normal stuff with it in the backround. obviously you can't do that with his Braindance works. Shows a different side of him. Early retirement ... I think not. "I'm self employed" and "VBS.Redlof.B" are my 2 favourite tracks from the entire Analord series, and are criminally missed off Chosen Lords (also possibly including the heavily underrated and frighteningly beautiful "Phonatacid" from Analord 02). But then again, part of the point of the Analord series revolves around its desirability and collectability - so why give away all its juicy morsels to those who don't invest in the original Vinyl.. It's a good album, but again, track choices really did stump me here. I miss Where's Your Girlfriend, VBS.Redlof, I'm Self Employed, and I don't feel that the whole of Analord 5 is essential. Reunion could have surely been taken out. Also what gets me is how there are only 10 tracks to the CD, but 11 Analords. 11 tracks would have been better to pick the best track from every Analord.